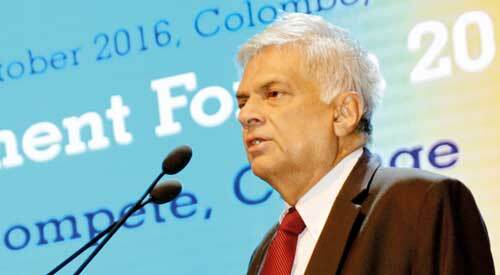 The private sector is to get a major boost from sweeping new trade policies and incentives to be ushered in by the Government over the next few weeks and in Budget 2017, said Prime Minister Ranil Wickremesinghe yesterday as he readied himself to fly to Brussels to engage with the European Union to reinstate GSP+ on Saturday. Addressing international and local business representatives at the World Export Development Forum (WEDF) sessions on Wednesday, Wickremesinghe gave a detailed, clear but concise view of the Government’s policies and insisted it was essential to take the better part of a year to resolve conflict and sort out details to be ready for implementation in the latest Budget. “On Saturday I am leaving Sri Lanka to Brussels for discussions on reinstating the GSP+ agreement but unlike in 2002 when growth depended on Europe, the shift is now coming to Asia. We are working on three important agreements with India, China and Singapore that will give us crucial market access,” he said. The Economic Cooperation and Technical Agreement (ETCA) with India will enable Sri Lanka to have closer engagement with Sri Lanka’s neighbour, especially the five southern states, which together with India are the fastest growing segment of the Indian subcontinent and at the moment have a combined GDP of $ 500 billion, Wickremesinghe noted. He also incisively recapped Sri Lanka’s post-independence history, pointing out that the country had lost trade advantages including GSP+ that were used by other countries to grow rapidly. As exports dwindled Sri Lanka also began to rely more on remittances and loan-driven growth, he observed, which ultimately failed to meet the aspirations of the people. Wickremesinghe emphasised that while Sri Lanka was concentrating on market access on the one hand, it was also preparing to offer encouragement to local and international investors. “Incentives will be announced soon for foreign direct investments and local investments to accelerate investments and one whole area that we will focus on and to give incentives for is the local manufacturing industry, to become competitive and grow. We have a fairly good manufacturing industry but they are catering to the domestic market but that will not create any more income. We have the potential to expand and grow into a nearby market because our local companies know regional markets. So we are planning to give incentives to get new machinery, get more people and expand,” he said. The Tourism and the Digital Economy sectors are ready to take off but have to be underpinned by human resource development, he went onto say, adding that local workers today had expectations. At a time when the global outlook is not unfavourable, Sri Lanka is working hard to deal with global trade headwinds and achieve growth, he insisted. The Sri Lankan Government is in talks with the China-backed Asian Infrastructure Investment Bank (AIIB) to facilitate a variety of infrastructure projects including renewable energy, water management systems, highways and port development, an official said yesterday. Participating in a panel discussion, AIIB Vice President and Chief Investment Officer Dr. D.J. Pandian said he had participated in discussions with top Government officials during his stay in Colombo this week. During the tenure of former President Mahinda Rajapaksa, Sri Lanka was a founding member of AIIB and the agreement was ratified by the new Government last year. “AIIB is in discussions with Sri Lanka to facilitate infrastructure development. We are interested in providing finance for power development. They have offered us a hydro project but I told them look into renewables. If there is insufficient capacity AIIB is also interested in power grid funding. We are also looking at Kelani River flood mitigation to reduce losses. Mahaweli water management systems are also being looking at. We are also ready to finance highways, including the central highway, or Colombo Trincomalee highway and road links to the port city. We are focused on modern infrastructure,” he told the gathering. Dr. Pandian was upbeat about Sri Lanka’s growth prospects and insisted that the country was an example of what could be achieved by linking to the China ‘One Road; One Belt’ initiative that would also attract support from AIIB. In January 2016 Chinese President Xi Jinping launched a new international development bank seen as a rival to the US-led World Bank at a lavish ceremony on Saturday, as Beijing seeks to change the unwritten rules of global development finance. Despite opposition from Washington, US allies including Australia, Britain, German, Italy, the Philippines and South Korea have agreed to join the Asian Infrastructure Investment Bank (AIIB) in recognition of China’s growing economic clout. In order for Asia to continue to be the most dynamic region for global growth it needs to invest in infrastructure and connectivity. The AIIB is expected to lend $ 10 billion-$ 15 billion a year for the first five or six years and began operations in the second quarter of 2016. In June AIIB approved $ 509 million in investments for its first four projects. Three of the four projects are co-financed with the World Bank, the Asian Development Bank, the United Kingdom Department for International Development and the European Bank for Reconstruction and Development. The projects were power grid upgrades in Bangladesh, slum renovation in Indonesia and highway construction in Pakistan and Tajikistan.